Photograph This! : Ring Flash for fashion: Yokoo Scarves! For this set I shot three scarves from Yokoo, a fancy knitter from Atlanta. Her great designs have been featured on the NYT. I wanted a look more sculpted than what is usually done for this kind of fashion (think Antrhopologie). The set up is the evolution from the one I had used recently for the Baby & Co. store: beauty dish high at camera left, strip behind model on camera right, gray background and flags. This time I added a ring flash as fill. I did not need too much power (I was shooting at f5.6) and so I used the cheap ring flash modifier mounted on a 'on camera' Canon 580x II. 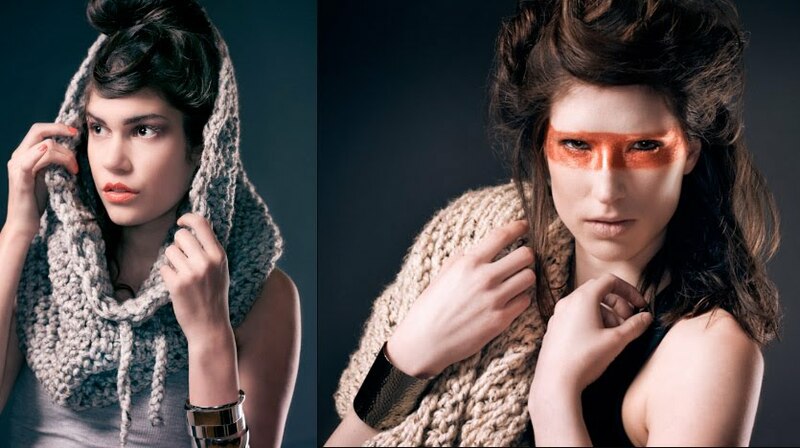 The ring flash really defines the texture of the scarves.